Note: Cyprus and Malta (not pictured) do not import electricity. The European Union (EU) has long sought more reliable ways to produce and distribute electricity and to coordinate its energy markets, including greater cross-border trading of electricity. The February coupling of electricity markets in Italy and France marks the most recent step toward an integrated European market. With this achievement, the majority of EU power markets are now linked. While the EU has pursued a single electricity market since 1994, Europe's Agency for the Cooperation of Energy Regulators in 2011 made market integration one of its top priorities. To meet these goals, the EU has been working on aligning national market and network operation rules, or tariffs, for natural gas and electricity as well as making cross-border investment in energy infrastructure easier. One reason the EU has explored a single electricity market is to expand wholesale electricity competition, with the intention of providing electricity at lower prices to customers through more efficient use of resources in Europe. 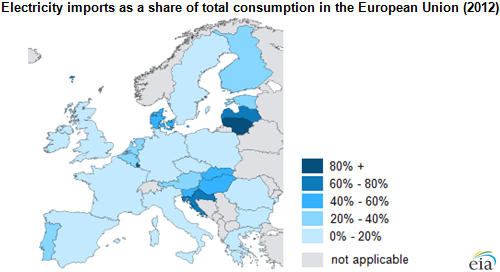 In many European countries, wholesale generation markets are dominated by a single supplier. 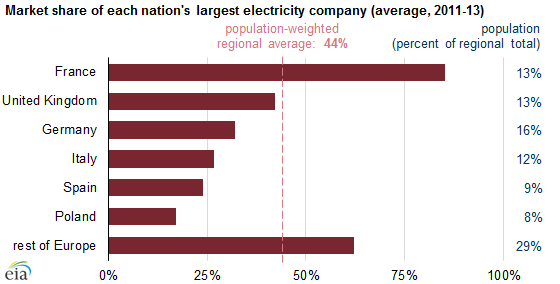 Poland is the only country in which the largest generating company has less than a 20% market share. Note: Rest of Europe includes remaining 28 EU member countries, as well as Norway, the Republic of Macedonia, and Bosnia and Herzegovina. Market coupling, a type of market design involving multiple power exchanges, is one step toward an integrated market. In this model, electricity markets are integrated by matching the highest purchase bids and lowest sales bids from different regions, taking into account the available interconnection capacities across regions. Market coupling brings the possibility of a single price between coupled countries. Market coupling also provides automated allocation of capacity, which limits potential manipulations by dominant market powers and decreases market transaction costs because participants do not submit margins and fees for auctions. Other market integration approaches include the vertical unbundling of generation, transmission, and distribution entities; the creation of retail competition; and the restructuring of current transmission and distribution networks and regulations. A recent annual progress report published by the European Commission on the energy market for electricity shows that overall cross-border trade and fair trading on wholesale markets increased as a result of recent initiatives. The report notes there are still additional steps needed to link retail and wholesale markets, as well as investments needed to improve electricity infrastructure.